Abu Dhabi: Among all of Abu Dhabi's recent developments, the ‘Island of Happiness' attracts a lot of interest. Known formally as Saadiyat (the Arabic word for happiness) Island, its development may be exciting but it is not particularly unique to the UAE. When compared to the rest of the world, however, the island represents an entirely unusual development trend. This is because throughout history, a place of dwelling and commercial activity has always been developed organically. People settle down around a place rich in natural resources, like a forest, or an area of easy access like a port. And as time progresses, schools, commercial institutions, health care facilities and more find their way to this neighbourhood, town, district or city, as the case may be. The Saadiyat Island's story is different. It was selected by the Government of Abu Dhabi to become a premier destination, and it is to that end that the 27 square kilometre piece of land is being developed to become home to more than 145,000 people in the future. With museums, schools, houses, offices and roads being built according to plan by the Abu Dhabi government-owned developer Tourism Development and Invest Company (TDIC), the island showcases another way in which a civilisation can be created. The island is located 500 metres off the coast of Abu Dhabi, and according to the TDIC, there will be seven districts within the island when finished. These sections — Saadiyat Cultural District, Saadiyat Beach, Saadiyat Marina, Saadiyat Lagoon, Saadiyat Reserve, Saadiyat Retreat and Saadiyat Promenade — will make the island an ideal place for family residences and tourism. And this theme is tied in with the name of the island, which itself is derived from its shape — that of an upturned smile. TDIC will overlook the various phases of development of the island, up until their expected completion by 2020. These phases and plans can now be seen at the Manarat Al Saadiyat (which in Arabic means ‘a place that provides enlightenment'), which opened in 2009 and attracts a lot of awe from visitors because of the scale of its developmental ambition. At present, the first phase of construction is underway for three flagship projects within the Saadiyat Cultural District. This district will showcase not only the national history at the Zayed National Museum by 2014, as well as contemporary art from around the world at the Guggenheim Museum by 2014 and the Louvre Abu Dhabi by 2013, but it will also allow young Emirati artists to showcase their work in a number of galleries in the area. It is this focus on art which will supposedly make the Saadiyat Island the home of culture and art in the capital. In later phases, a Performing Arts Centre and a Maritime Museum will also be built. Also open to the public now is the famed Gary Player Golf Course off the 9-km-long Saadiyat Beach, which will develop into its own district with nearly 600 villas when finished. 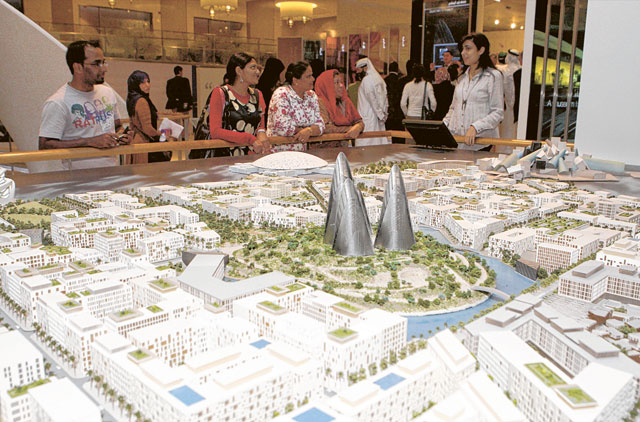 According to TDIC's plans, more than 50 per cent of Saadiyat Island's residents will reside in the Marina district, which should house about 1,000 high-rise buildings, schools and a branch of the New York University. Apart from the commercial activity, the main feature will be a marina which can hold more than 80 yachts at a time. The Lagoon district is expected to provide a Venetian living experience, with water taxis and ferry services carrying residents and visitors to and fro. Future developments in the area will also include a slew of theatres. The Saadiyat Promenade will include a range of beach activities, while the Saadiyat Retreat — in a corner of the island — will house a range of exclusive villas and possibly even seven-star hotels. The Saadiyat Reserve is also expected to become the environmental centre of the island. 400,000 mangroves will span the area, and special attention will be paid to providing Hawksbill turtles with dunes on the beach to nest and breed in. Saadiyat Cultural District: Zayed National Museum, Louvre Abu Dhabi, Guggenheim Museum, Maritime Museum, Performing Arts Centre, The Souq. Saadiyat Beach: Gary Player Golf Course, Dolphins at the beach. Saadiyat Retreat: Exclusive villas, Seven-star hotels. Saadiyat Reserve: Mangroves, Hawksbill turtles. Saadiyat Marina: High-rise buildings, New York University branch. Saadiyat Lagoon: Venetian houses, Water taxis, Theatres.